Apparently, there are worse situations than wishing you wore an outfit with a matte purple lipstick rather than sticking to your good ol' glazed beige lipstick. (Haha, ew! Who wears that nowadays?) But honestly, I just couldn't think of any, most especially when my tagged photos from five years ago are still coming back to haunt me. 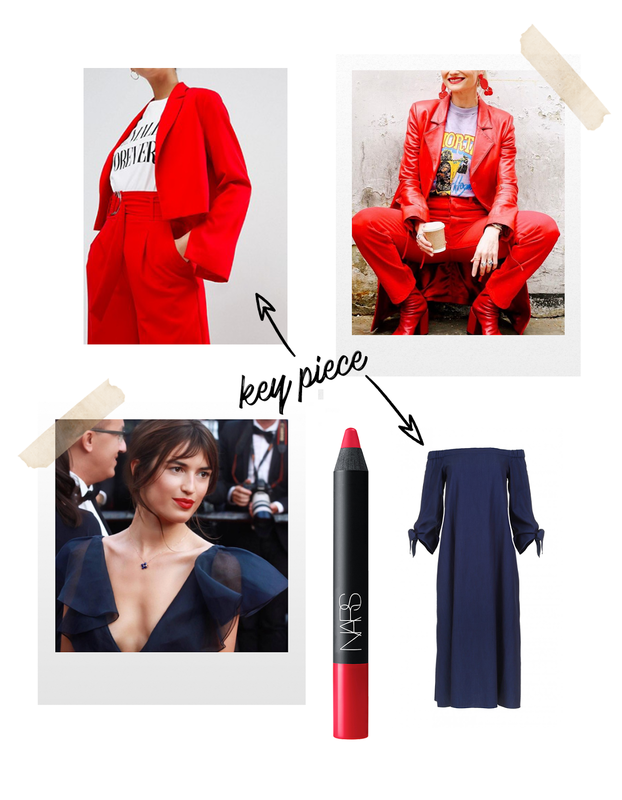 So here, I've done all the dirty work and rummaged around the web to bring you the coolest outfit and lip color pairings, featuring the 7 new shades of NARS Velvet Matte Lip Pencil*. Hopefully, in the next five years, this outfit remains cool so you won't have to search Google how to un-tag a photo. Red lip? Put on your striped Breton top and a pair of your good ol' jeans. Easy peasy. But wait, who are you kidding? Leave that to the French and the wannabe French. A bright coral lip deserves an equally bold outfit. I love taking cues from Pandora Sykes, a modern day sartorial icon of fun, fab and cool in one. She wore a full bright red ensemble which she wore with — you guessed it — a bold red lip, and accessorized it with red beaded flamenca earrings and a cup of coffee in one hand. God, this lady is so cool. 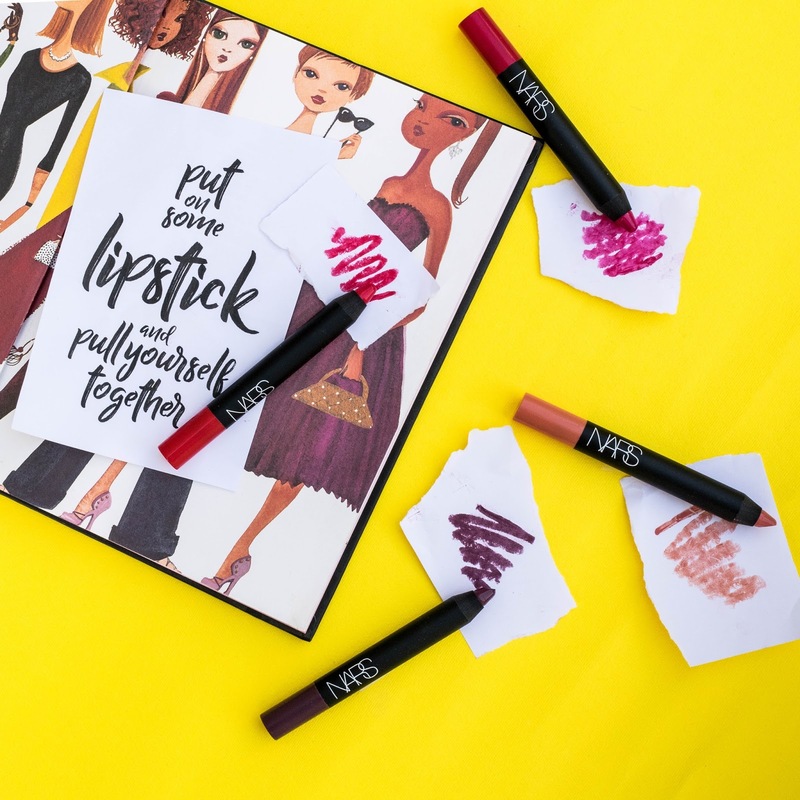 But for those who aren't ready to risk looking like just another bold red lip pencil in human form, you can swap the red pants with a pair of mom jeans. Jeanne Damas may be the ultimate French girl. She likes wearing nothing with a pair of jeans, flowy dresses and everything that screams Parisian. But the idea of taking her red carpet style to my upcoming tropical vacation gives me butterflies. That said, I shall begin with this navy OTS summer dress. Get Off is the 'your lips but better' kind of shade. It's the shade for the baby girl in you. Baby girl but badass if you wear it a la Alexa Chung in this denim romper. But here's the crucial part: if you're wearing the sleeveless variety of the denim romper, forget about it altogether. That's not the look we're going for. We want to go for the rough rider's daughter look — one who got her mom's softheartedness and her dad's tough demeanor. I also love how Bella Hadid made the pink beige lip color look so glamorous, filthy expensive and smoking hot with the silk white co-ord. But there again, this is Bella Hadid we're talking about. WARNING: Lonely Heart is not for the faint-hearted. When I tried this on for the first time, I wanted a muted brown lip; after all it was a day I know I'm only gonna spend eating juicy burger and fries, and shopping for my summer trip. So I went on and on; until I've put on the second coat, and boy was it soooo dark and bold... AND BEAUTIFUL!!! What was in my mind that moment, however, was actually: should I change? But didn't anyway because I didn't have the time. It wasn't so hard to find an outfit inspiration for this shade because I know Rihanna wears it like it's a typical lip color every person in the world can pull off. News flash: it's not; and in fact, it can change people's opinion of you from "ya she's kinda cute" to "what did she eat an entire 14-inch dark chocolate cake before coming here." This chocolate brown lip color entails a certain posh factor to get the look right. Our bad gal fella here wore a pink gingham suit and skirt set. She looked 30% posh, 70% badass, as usual. Sometimes it makes me wonder: what makes bad gal riri so bad? Is it her tan? Her flair for accessorizing? Her tattoos? I mean, have you seen her underboob tattoo? Is she even real??? And so we've arrived at my most favorite part. It was love at first sight with this shade. This chestnut rose shade is naughty and/or nice, sugar and/or spice — it totally depends on how you wear it. I've worn this with a white tank top and jogger pants from the men's section because I am very modern and think clothing has no gender. Just kidding, I just loved how comfortable they fit. They're Abercrombie & Fitch, btw. When sportswear became a trend, I told myself "finally a trend that I like." Not because of some baloney fashion editors would say, but because who the hell doesn't want to be out and about (may or may not be at an afternoon tea) in her sports bra, blazer, trousers and sneakers? The oversized blazer + (sports bra + leggings [both black]) outfit formula is something I'd wear again and again, as also seen on Ana Prodanovich. She is the kind of girl who has an entire drawer of lipsticks that are almost the same shade, methinks. I've never seen her wear pinks, reds or brights on the lips as it's probably too girly-girl for her liking. Which makes her an easy target for me to take an outfit inspiration from, albeit the sea of Insta-girls who wear the same shade of lip color all the time. I've always followed Susie Lau (Style Bubble) since the beginning, but think her style is a little bit over the top — print on print, texture on texture, volume on volume, and sometimes all these in one outfit. She's fearless when it comes to mixing pieces whatever other people might say against her strange sartorial concoction. If I can personify this lip color, Susie Lau is just it. It's bold but still wearable, and only people who know exactly what they want to see can appreciate the beauty of it. Plus, she knows exactly how to rock it in — I guess, we can call this the Susie Lau minimalism (because is this the most minimal she can be?) — white crisp button-down and black FW 2009 Prada sleeveless coat. If there's any lip color that quintessentially screams summer, it's this vivid pink. 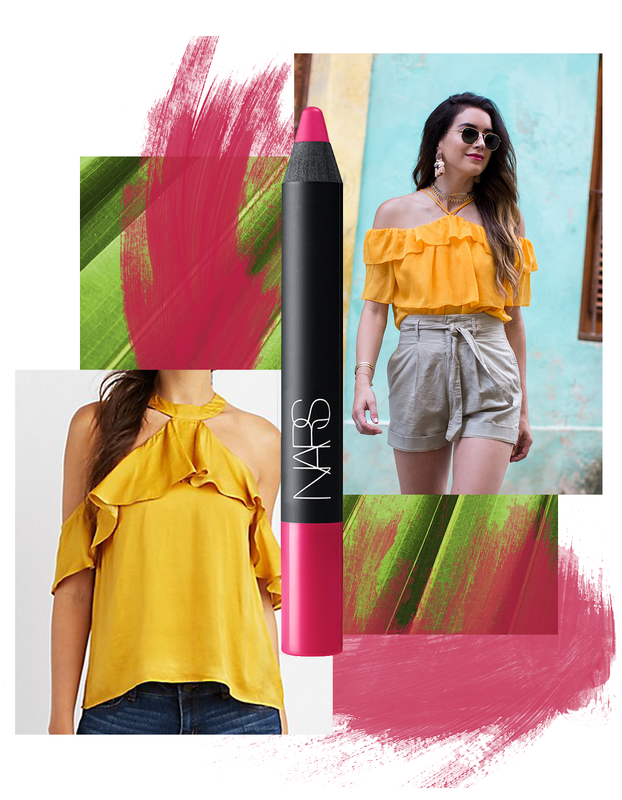 What better way to wear it than with an equally vivid yellow cold shoulder top as donned by Brittany aka Thrifts and Threads. 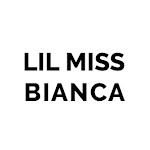 Is it just me or does everyone call a blogger by their blog name IRL and not their actual given name? I love this post! All the colors are so pretty!